CHINO, CALIFORNIA, USA, April 12, 2019 /EINPresswire.com/ -- Chino, CA – Some of the fiercest pilots to come out of the Vietnam War reunited this week in Pensacola, FL to celebrate the 50th Anniversary of their formation. 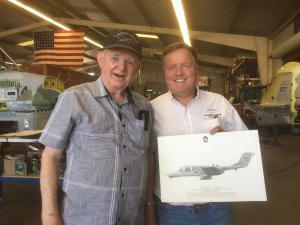 And they will soon be celebrating an entirely recommissioned squadron of the aircraft they made famous – The OV-10 Bronco. Backed by their propeller-driven Broncos, the Black Ponies were the go-to fighting force for close combat operations in Vietnam, supporting counter insurgency forces of all stripes, including the Navy SEALs.